Exciting Korean, A Practical Listening Guide for Intermediate ปกติ 1,099.00 บ.
Korean Listening for University Life - Beginning Level 1 ปกติ 1,395.00 บ.
Korean Listening for University Life - Beginning Level 2 ปกติ 1,395.00 บ.
Korean Listening for University Life - Intermediate Level 1 ปกติ 1,395.00 บ.
Korean Listening for University Life - Intermediate Level 2 ปกติ 995.00 บ.
Korean Listening Skills : Practical Tasks for Beginners ปกติ 850.00 บ.
Korean Listening Skills : Practical Tasks for Intermediate Learners ปกติ 850.00 บ.
Mastering Intermediate Korean Listening within a Month I ปกติ 1,085.00 บ.
Mastering Intermediate Korean Listening within a Month II ปกติ 1,195.00 บ. News in Korean ปกติ 1,125.00 บ.
Yonsei Korean Reading 1 ปกติ 1,195.00 บ.
Yonsei Korean Reading 2 ปกติ 1,195.00 บ.
Yonsei Korean Reading 3 ปกติ 1,195.00 บ.
Yonsei Korean Reading 4 ปกติ 1,195.00 บ.
Yonsei Korean Reading 5 ปกติ 1,195.00 บ.
Yonsei Korean Reading 6 ปกติ 1,195.00 บ.
Korean Speaking - Beginner 1 (Situation) ปกติ 1,155.00 บ.
Korean Speaking Easy for Foreigners : Beginner 2 ปกติ 1,155.00 บ.
Korean Speaking Easy for Foreigners : Beginner 3 ปกติ 1,155.00 บ.
Korean Speaking Easy for Foreigners : Beginner 4 ปกติ 1,155.00 บ.
Korean Speaking Easy for Foreigners : Intermediate 1 ปกติ 1,155.00 บ.
Korean Speaking Easy for Foreigners : Intermediate 2 ปกติ 1,155.00 บ.
Korean Speaking Easy for Foreigners : Intermediate 3 ปกติ 1,155.00 บ.
Korean Speaking Easy for Foreigners : Intermediate 4 ปกติ 1,155.00 บ.
Korean Speaking for University Life - Beginning Level 1 ปกติ 1,395.00 บ.
Korean Speaking for University Life - Beginning Level 2 ปกติ 1,325.00 บ.
Korean Speaking for University Life - Intermediate Level 1 ปกติ 1,135.00 บ.
Korean Speaking for University Life - Intermediate Level 2 ปกติ 995.00 บ.
Mastering Intermediate Korean Speaking within a Month I ปกติ 895.00 บ.
Mastering Intermediate Korean Speaking within a Month II ปกติ 895.00 บ.
Korean Writing for University Life - Beginning Level 1 ปกติ 1,255.00 บ.
Korean Writing for University Life - Beginning Level 2 ปกติ 1,255.00 บ.
Korean Writing for University Life - Intermediate Level 1 ปกติ 1,055.00 บ.
Korean Writing for University Life - Intermediate Level 2 ปกติ 975.00 บ.
Mastering Intermediate Korean Writing within a Month I ปกติ 955.00 บ.
Mastering Intermediate Korean Writing within a Month II ปกติ 1,055.00 บ. HOT TOPIK (New TOPIK I) ปกติ 1,525.00 บ. HOT TOPIK (New TOPIK I) - Reading ปกติ 1,099.00 บ. HOT TOPIK (New TOPIK II) ปกติ 1,525.00 บ. HOT TOPIK (New TOPIK II) - Reading ปกติ 1,099.00 บ. HOT TOPIK (New TOPIK II) - Writing ปกติ 1,099.00 บ.
Korean Language Proficiency Test TOPIK I ปกติ 1,500.00 บ.
Korean Language Proficiency Test TOPIK II ปกติ 1,500.00 บ.
Korean Proficiency Test TOPIK Ⅱ Writing ปกติ 1,400.00 บ. Master Key to the B-ToKL ปกติ 895.00 บ. Master Key to the P-ToKL ปกติ 975.00 บ. Mind Map TOPIK VOCA ปกติ 1,375.00 บ. New TOPIK I : Essential Grammar 101 Elementary ปกติ 1,099.00 บ. New TOPIK II : Essential Grammar 150 ปกติ 1,195.00 บ. NEW TOPIK MASTER : TOPIK I (BASIC) ปกติ 1,295.00 บ. NEW TOPIK MASTER : TOPIK II (Intermediate Advanced) ปกติ 1,295.00 บ. 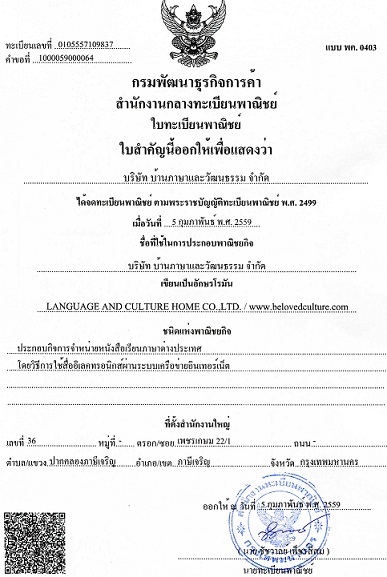 Test Guide to the NEW TOPIK : TOPIK I (Basic) ปกติ 765.00 บ. Test Guide to the NEW TOPIK : TOPIK II (Intermediate and Advanced) ปกติ 975.00 บ.
TOPIK : Essential Grammar 150, Intermediate ปกติ 1,275.00 บ.
TOPIK II : Writing ปกติ 1,099.00 บ.
TOPIK II Practical Mock Test ปกติ 1,045.00 บ.
TOPIK Vocabulary for Advanced Level ปกติ 1,275.00 บ.
TOPIK Vocabulary for Intermediate ปกติ 1,275.00 บ.
Yonsei TOPIK II Listening ปกติ 1,375.00 บ.
Yonsei TOPIK II Reading ปกติ 1,225.00 บ.
Arirang Korean Basics 1 ปกติ 750.00 บ.
Arirang Korean Basics 2 ปกติ 750.00 บ. Beautiful Korean (Student Book II-2 Low-Intermediate) ปกติ 1,150.00 บ. Beautiful Korean (Workbook II-2 Low-Intermediate) ปกติ 850.00 บ. Easy Korean for Foreigners 1 ปกติ 1,150.00 บ. Easy Korean for Foreigners 2 ปกติ 1,150.00 บ. Easy Korean for Foreigners 3 ปกติ 1,150.00 บ. Easy Korean for Foreigners 4 ปกติ 1,150.00 บ. Easy Korean for Foreigners 5A ปกติ 1,150.00 บ. Easy Korean for Foreigners 5B ปกติ 1,150.00 บ. Easy Korean for Foreigners Workbook 1 ปกติ 795.00 บ. Easy Korean for Foreigners Workbook 2 ปกติ 795.00 บ. Easy Korean for Foreigners Workbook 3 ปกติ 795.00 บ. Easy Korean for Foreigners Workbook 4 ปกติ 795.00 บ. Easy Korean for Foreigners Workbook 5A ปกติ 795.00 บ. Easy Korean for Foreigners Workbook 5B ปกติ 795.00 บ. Fast and Fun Korean for Short-Term Learners 1 ปกติ 855.00 บ. Fast and Fun Korean for Short-Term Learners 2 ปกติ 855.00 บ. How to Learn Korean : Hello, Beginning Korean 1 ปกติ 865.00 บ. How to Learn Korean : Hello, Beginning Korean 2 ปกติ 835.00 บ. How to Learn Korean : Hello, Beginning Korean Workbook ปกติ 565.00 บ. How to Learn Korean : Hello, Intermediate Korean 1 ปกติ 835.00 บ. How to Learn Korean : Hello, Intermediate Korean 2 ปกติ 835.00 บ. How to Learn Korean : Hello, Intermediate Korean Workbook ปกติ 635.00 บ. How to Learn Korean : Korean in Pictures ปกติ 605.00 บ.
Korean 1 - Daily Life with Family ปกติ 1,295.00 บ.
Korean 2 - Play Leisure ปกติ 1,295.00 บ.
Korean 3 - Society and Institution ปกติ 1,295.00 บ.
Korean for Intermediate Learners 1 ปกติ 1,545.00 บ.
Korean Made Easy - Starter ปกติ 795.00 บ.
Korean Made Easy for Beginners ปกติ 895.00 บ.
Korean Made Easy for Everyday Life ปกติ 925.00 บ.
Korean Made Easy – Vocabulary ปกติ 1,095.00 บ.
Korean through English : Book 1 ปกติ 795.00 บ.
Korean through English : Book 2 ปกติ 850.00 บ. Learn Korean through Songs ปกติ 1,295.00 บ. Master Korean 1-1 ปกติ 1,100.00 บ. Master Korean 1-2 ปกติ 1,100.00 บ. Master Korean 2-1 ปกติ 1,100.00 บ. New GANADA Korean for Foreigners : Advanced 1 (English Version) ปกติ 1,395.00 บ. New GANADA Korean for Foreigners : Elementary 1 (English Version) ปกติ 1,395.00 บ. New GANADA Korean for Foreigners : Elementary 2 (English Version) ปกติ 1,395.00 บ. New GANADA Korean for Foreigners : Intermediate 1 (English Version) ปกติ 1,395.00 บ. New GANADA Korean for Foreigners : Intermediate 2 (English Version) ปกติ 1,395.00 บ. New GANADA Korean for Foreigners : Workbook Advanced 1 (English/Japanese/Chinese) ปกติ 850.00 บ. New GANADA Korean for Foreigners : Workbook Elementary 1 (English/Japanese/Chinese) ปกติ 850.00 บ. New GANADA Korean for Foreigners : Workbook Elementary 2 (English/Japanese/Chinese) ปกติ 850.00 บ. New GANADA Korean for Foreigners : Workbook Intermediate 1 (English/Japanese/Chinese) ปกติ 850.00 บ. New GANADA Korean for Foreigners : Workbook Intermediate 2 (English/Japanese/Chinese) ปกติ 850.00 บ. Practical Korean : Basic 1 ปกติ 995.00 บ. Practical Korean : Basic 2 ปกติ 1,035.00 บ. Step by Step : Korean 1 through 15 Action Verbs ปกติ 1,090.00 บ. Step by Step Korean Penmanship ปกติ 695.00 บ. Time for Korean : Book 1 ปกติ 850.00 บ. Time for Korean : Book 2 ปกติ 850.00 บ. Yes, You Can Learn Korean Language Structure in 40 Minutes. ปกติ 735.00 บ. Yes, You Can Speak Korean! Book 1 ปกติ 965.00 บ. Yes, You Can Speak Korean! Book 2 ปกติ 965.00 บ.
Korean 1 in 100 Hours ปกติ 1,085.00 บ.
Korean 2 in 100 Hours ปกติ 1,085.00 บ.
Korean 3 in 100 Hours ปกติ 1,085.00 บ.
Korean 4 in 100 Hours ปกติ 1,085.00 บ.
Korean 5 in 100 Hours ปกติ 1,085.00 บ.
Korean 6 in 100 Hours ปกติ 1,085.00 บ.
Yonsei Korean 1-1 English Version ปกติ 1,195.00 บ.
Yonsei Korean 1-2 English Version ปกติ 1,195.00 บ.
Yonsei Korean 2-1 English Version ปกติ 1,195.00 บ.
Yonsei Korean 2-2 English Version ปกติ 1,195.00 บ.
Yonsei Korean 3-1 English Version ปกติ 1,195.00 บ.
Yonsei Korean 3-2 English Version ปกติ 1,195.00 บ.
Yonsei Korean 4 ปกติ 1,425.00 บ.
Yonsei Korean 5 ปกติ 1,425.00 บ.
Yonsei Korean 6 ปกติ 1,425.00 บ.
Yonsei Korean in 3 Weeks : Volume 1 ปกติ 1,355.00 บ.
Yonsei Korean in 3 Weeks : Volume 2 ปกติ 1,355.00 บ.
Yonsei Korean in 3 Weeks : Volume 3 ปกติ 1,355.00 บ.
Yonsei Korean in 3 Weeks : Volume 4 ปกติ 1,355.00 บ.
Yonsei Korean in 3 Weeks : Volume 5 ปกติ 1,355.00 บ.
Yonsei Korean in 3 Weeks : Volume 6 ปกติ 1,355.00 บ.
Yonsei Korean in 3 Weeks : Volume 7 ปกติ 1,355.00 บ.
Yonsei Korean in 3 Weeks : Volume 8 ปกติ 1,355.00 บ.
Yonsei Korean Workbook 1 ปกติ 995.00 บ.
Yonsei Korean Workbook 2 ปกติ 995.00 บ.
Yonsei Korean Workbook 3 ปกติ 995.00 บ.
Yonsei Korean Workbook 4 ปกติ 995.00 บ.
Yonsei Korean Workbook 5 ปกติ 995.00 บ.
Yonsei Korean Workbook 6 ปกติ 995.00 บ. Active Korean 1 ปกติ 955.00 บ. Active Korean 1 Workbook ปกติ 695.00 บ. Active Korean 2 ปกติ 955.00 บ. Active Korean 2 Workbook ปกติ 695.00 บ. Active Korean 3 ปกติ 955.00 บ. Active Korean 3 Workbook ปกติ 695.00 บ. Active Korean 4 ปกติ 955.00 บ. Active Korean 4 Workbook ปกติ 695.00 บ.
Korean 1 : Practice Book ปกติ 875.00 บ.
Korean 1 : Practice Book with CD ปกติ 1,570.00 บ.
Korean 1 with CD ปกติ 1,575.00 บ.
Korean 2 : Practice Book ปกติ 875.00 บ.
Korean 2 : Practice Book with CD ปกติ 1,570.00 บ.
Korean 2 with CD ปกติ 1,575.00 บ.
Korean 3 : Practice Book ปกติ 875.00 บ.
Korean 3 : Practice Book with CD ปกติ 1,570.00 บ.
Korean 3 with CD ปกติ 1,575.00 บ.
Korean 4 : Practice Book ปกติ 875.00 บ.
Korean 4 : Practice Book with CD ปกติ 1,570.00 บ.
Korean 4 with CD ปกติ 1,575.00 บ.
Seoul University Korean 1A (Student's Book) ปกติ 1,555.00 บ.
Seoul University Korean 1A (Workbook) ปกติ 1,175.00 บ.
Seoul University Korean 1B (Student's Book) ปกติ 1,555.00 บ.
Seoul University Korean 1B (Workbook) ปกติ 1,175.00 บ.
Seoul University Korean 2A (Student's Book) ปกติ 1,555.00 บ.
Seoul University Korean 2A (Workbook) ปกติ 1,175.00 บ.
Seoul University Korean 2B (Student's Book) ปกติ 1,555.00 บ.
Seoul University Korean 2B (Workbook) ปกติ 1,175.00 บ.
Seoul University Korean 3A (Student's Book) ปกติ 1,555.00 บ.
Seoul University Korean 3A (Workbook) ปกติ 1,175.00 บ.
Seoul University Korean 3B (Student's Book) ปกติ 1,555.00 บ.
Seoul University Korean 3B (Workbook) ปกติ 1,175.00 บ.
Seoul University Korean 4A (Student's Book) ปกติ 1,555.00 บ.
Seoul University Korean 4A (Workbook) ปกติ 1,175.00 บ.
Seoul University Korean 4B (Student's Book) ปกติ 1,555.00 บ.
Seoul University Korean 4B (Workbook) ปกติ 1,175.00 บ.
Seoul University Korean 5A (Student's Book) ปกติ 1,555.00 บ.
Seoul University Korean 5A (Workbook) ปกติ 1,175.00 บ.
Seoul University Korean 5B (Student's Book) ปกติ 1,555.00 บ.
Seoul University Korean 5B (Workbook) ปกติ 1,175.00 บ.
Seoul University Korean 6A (Student's Book) ปกติ 1,555.00 บ.
Seoul University Korean 6A (Workbook) ปกติ 1,175.00 บ.
Seoul University Korean 6B (Student's Book) ปกติ 1,555.00 บ.
Seoul University Korean 6B (Workbook) ปกติ 1,175.00 บ. ซีดีสำหรับ Korean 1 : Practice Book ปกติ 915.00 บ. ซีดีสำหรับ Korean 2 : Practice Book ปกติ 915.00 บ. ซีดีสำหรับ Korean 3 : Practice Book ปกติ 915.00 บ. ซีดีสำหรับ Korean 4 : Practice Book ปกติ 660.00 บ. ซีดีสำหรับภาษาเกาหลี 1 ปกติ 875.00 บ. ซีดีสำหรับภาษาเกาหลี 2 ปกติ 875.00 บ. ซีดีสำหรับภาษาเกาหลี 3 ปกติ 875.00 บ. ซีดีสำหรับภาษาเกาหลี 4 ปกติ 875.00 บ. ภาษาเกาหลี 1 (Korean 1) ปกติ 1,025.00 บ. ภาษาเกาหลี 2 (Korean 2) ปกติ 1,025.00 บ. ภาษาเกาหลี 3 (Korean 3) ปกติ 1,025.00 บ. ภาษาเกาหลี 4 (Korean 4) ปกติ 1,025.00 บ.
Ewha Korean 3-1 ปกติ 915.00 บ.
Ewha Korean 3-2 ปกติ 915.00 บ.
Ewha Korean 4 ปกติ 1,175.00 บ.
Ewha Korean 5 ปกติ 1,175.00 บ.
Ewha Korean 6 ปกติ 1,175.00 บ.
Ewha Korean English Version 1-1 ปกติ 915.00 บ.
Ewha Korean English Version 1-2 ปกติ 915.00 บ.
Ewha Korean English Version 2-1 ปกติ 915.00 บ.
Ewha Korean English Version 2-2 ปกติ 915.00 บ.
Ewha Korean Study Guide 1-1 English Version ปกติ 895.00 บ.
Ewha Korean Study Guide 1-2 English Version ปกติ 895.00 บ.
Ewha Korean Study Guide 2-1 English Version ปกติ 895.00 บ.
Ewha Korean Study Guide 2-2 English Version ปกติ 895.00 บ.
Ewha Korean Study Guide 3-1 English Version ปกติ 895.00 บ.
Ewha Korean Study Guide 3-2 English Version ปกติ 895.00 บ.
Ewha Korean Study Guide 4 English Version ปกติ 999.00 บ.
Ewha Korean Study Guide 5 English Version ปกติ 999.00 บ.
Ewha Korean Study Guide 6 English Version ปกติ 999.00 บ.
Ewha Korean Workbook 1-1 ปกติ 755.00 บ.
Ewha Korean Workbook 1-2 ปกติ 755.00 บ.
Ewha Korean Workbook 2-1 ปกติ 755.00 บ.
Ewha Korean Workbook 2-2 ปกติ 755.00 บ.
Ewha Korean Workbook 3-1 ปกติ 755.00 บ.
Ewha Korean Workbook 3-2 ปกติ 755.00 บ.
Ewha Korean Workbook 4 ปกติ 755.00 บ.
Ewha Korean Workbook 5 ปกติ 755.00 บ.
Ewha Korean Workbook 6 ปกติ 755.00 บ.
Pathfinder in Korean (Student Book + English CD for Low Intermediate) ปกติ 1,285.00 บ.
Pathfinder in Korean (Student Book +CD for Advanced I) ปกติ 1,285.00 บ.
Pathfinder in Korean (Student Book +CD for Advanced II) ปกติ 1,285.00 บ.
Pathfinder in Korean (Student Book +English CD for High Intermediate) ปกติ 1,285.00 บ.
Pathfinder in Korean (Student Book for Beginning) ปกติ 1,285.00 บ.
Pathfinder in Korean (Workbook for Advanced I) ปกติ 850.00 บ.
Pathfinder in Korean (Workbook for Advanced II) ปกติ 850.00 บ.
Pathfinder in Korean (Workbook for Beginning) ปกติ 850.00 บ.
Pathfinder in Korean (Workbook for High Intermediate) ปกติ 850.00 บ.
Pathfinder in Korean (Workbook for Low Intermediate) ปกติ 850.00 บ.
Pathfinder in Korean I : Glossary-English ปกติ 695.00 บ.
Pathfinder in Korean II : Glossary-English ปกติ 695.00 บ.
Pathfinder in Korean III : Glossary-English ปกติ 695.00 บ.
Pathfinder in Korean IV : Glossary-English ปกติ 695.00 บ. 2000 Essential Korean Words for Beginners ปกติ 1,085.00 บ. 2000 Essential Korean Words for Intermediate ปกติ 1,295.00 บ. 500 Basic Korean Adjectives ปกติ 1,500.00 บ. Dictionary of Korean Idioms ปกติ 1,450.00 บ. Essential Korean for Everyday Use ปกติ 750.00 บ.
Korean Conversation Dictionary for Foreigners (English-Korean) ปกติ 875.00 บ.
Korean Essential Vocabulary 6000 for Foreigners ปกติ 750.00 บ.
Korean Phrase Book for Travellers ปกติ 650.00 บ.
Korean Phrase Book for Travellers (English-Korean Korean English) Revised Edition ปกติ 935.00 บ.
Korean Picture Dictionary ปกติ 1,199.00 บ.
Korean Picture Dictionary : Workbook ปกติ 895.00 บ.
Korean Vocabulary Practice for Foreigners : Advanced Level ปกติ 1,235.00 บ.
Korean Vocabulary Practice for Foreigners : Beginning Level ปกติ 1,235.00 บ.
Korean Vocabulary Practice for Foreigners : Intermediate Level ปกติ 1,235.00 บ.
Korean-English, English-Korean : Basic Korean Dictionary ปกติ 995.00 บ. Let's Talk in Korean ปกติ 650.00 บ.
Minjung's Essence Korean-English Dictionary ปกติ 2,150.00 บ. Standard English-Korean Dictionary for Foreigners ปกติ 995.00 บ. Standard English-Korean, Korean-English Dictionary for Foreigners ปกติ 1,045.00 บ. Useful Chinese Characters for Learners of Korean ปกติ 850.00 บ. 4 CUT KOREAN CARTOON ปกติ 950.00 บ.
Brave Hong Gil-dong The Man who Bought the Shade of a Tree ปกติ 875.00 บ. Learning Korean through Folk Tales ปกติ 1,175.00 บ. Learning Korean through Traditional Fairy Tales ปกติ 1,175.00 บ.
Mr.Moon and Miss Sun and The Herdsman and the Weaver ปกติ 875.00 บ. The Faithful Daughter Sim Cheong and The Little Frog Who Never Listened ปกติ 875.00 บ. The Greedy Princess ปกติ 875.00 บ. The Lazy Man and The Spring of Youth ปกติ 875.00 บ. The Ogres' Magic Clubs The Tiger and the Dried Persimmons ปกติ 875.00 บ. The Seven Brothers and the Big Dipper and Heungbu, Nolbu and the Magic Gourds ปกติ 875.00 บ. The Snail Lady and The Magic Vase ปกติ 875.00 บ. The Son of the Cinnamon Tree and the Donkey's Egg ปกติ 875.00 บ. The Woodcutter and the Heavenly Maiden and the Firedogs ปกติ 875.00 บ. A Brief History of Korea ปกติ 965.00 บ.
K-POP Korean ปกติ 1,050.00 บ.
Korean Culture 77 for Everyday Life ปกติ 950.00 บ. The Story of Korean Language and Culture ปกติ 935.00 บ. A Korean Mother's Cooking Notes ปกติ 1,435.00 บ. CHEF KOREAN ปกติ 1,435.00 บ. Good Morning, Kimchi! ปกติ 855.00 บ.
Healthful Korean Cooking ปกติ 835.00 บ.
Korean Family Food ปกติ 1,055.00 บ. Low Fat Korean Cooking ปกติ 855.00 บ. Practical Korean Cooking ปกติ 1,135.00 บ. The Beauty of Korean Food ปกติ 1,055.00 บ.
Heartstrings 1 ปกติ 975.00 บ.
Heartstrings 1 (Drama Photo Book) ปกติ 975.00 บ.
Heartstrings 2 ปกติ 975.00 บ.
Heartstrings 2 (Drama Photo Book) ปกติ 975.00 บ. Late Autumn Screenplay ปกติ 995.00 บ. My Girlfriend is a Gumiho 1 (Drama Photo Book) ปกติ 975.00 บ. My Girlfriend is a Gumiho 2 (Drama Photo Book) ปกติ 975.00 บ. My Girlfriend is a Gumiho 3 (Drama Photo Book) ปกติ 975.00 บ. My Princess ปกติ 950.00 บ. Secret Garden 1 (Drama Photo Book) ปกติ 975.00 บ. Secret Garden 2 (Drama Photo Book) ปกติ 975.00 บ. The Moon that Embraces the Sun 1 ปกติ 950.00 บ. The Moon that Embraces the Sun 2 ปกติ 950.00 บ. The Princess' Man 1 (Drama Photo Book) ปกติ 975.00 บ. The Princess' Man 2 (Drama Photo Book) ปกติ 975.00 บ. You're Beautiful 1 ปกติ 975.00 บ. You're Beautiful 1 (Drama Photo Book) ปกติ 975.00 บ. You're Beautiful 2 ปกติ 975.00 บ. You're Beautiful 2 (Drama Photo Book) ปกติ 975.00 บ. You're Beautiful 3 (Drama Photo Book) ปกติ 975.00 บ. บัณฑิตหน้าใส หัวใจว้าวุ่น 1 ปกติ 975.00 บ. บัณฑิตหน้าใส หัวใจว้าวุ่น 2 ปกติ 975.00 บ. Character Sticker ปกติ 565.00 บ. Clear File ปกติ 595.00 บ. Couple Mini Album Mobile Phone Strap ปกติ 715.00 บ.
Dooly Couple's Teddy Bear Mobile Strap ปกติ 699.00 บ.
Epoxy Miniature Mobile Strap : Jang Geunsuk with guitar ปกติ 675.00 บ.
Epoxy Miniature Mobile Strap : Jang Geunsuk with stuff ปกติ 675.00 บ.
Epoxy Miniature Mobile Strap : Jung Yonghwa with stuff ปกติ 675.00 บ.
Epoxy Miniature Mobile Strap : Park Shinhye with stuff ปกติ 675.00 บ.
Jang Geunsuk : iPhone Case (4/4S) Black ปกติ 1,150.00 บ.
Jang Geunsuk : iPhone Case (4/4S) Pink Guitar ปกติ 1,150.00 บ.
Jang Geunsuk : iPhone Case (4/4S) Pink Mike ปกติ 1,150.00 บ.
Jang Geunsuk : iPhone Case (4/4S) Purple ปกติ 1,150.00 บ.
Jang Geunsuk : iPhone Case (4/4S) Red ปกติ 1,150.00 บ.
Jang Geunsuk : iPhone Case (4/4S) Sky ปกติ 1,150.00 บ.
Jang Geunsuk : iPhone Case (4/4S) Yellow Rainbow ปกติ 1,150.00 บ.
Jang Geunsuk Adhesive Mobile Phone Accessory ปกติ 699.00 บ.
Jang Geunsuk Guitar Key Holder ปกติ 699.00 บ.
Jang Geunsuk Guitar Mobile Phone Strap ปกติ 699.00 บ.
Jang Geunsuk Guitar Mobile Phone Strap ปกติ 645.00 บ.
Jang Geunsuk Mini Album Key Holder ปกติ 755.00 บ.
Jang Geunsuk Mini Album Mobile Phone Strap ปกติ 725.00 บ.
Jang Geunsuk Star Key Holder ปกติ 699.00 บ.
Jang Keunsuk Nametag ปกติ 699.00 บ.
Jang Keunsuk Photo Note ปกติ 775.00 บ.
Jang Keunsuk Photo Note (big-sized picture) ปกติ 775.00 บ.
Jang Keunsuk Photo Note (small-sized picture) ปกติ 775.00 บ.
Jung Yonghwa : iPhone Case (4/4S) Bicycle ปกติ 1,150.00 บ.
Jung Yonghwa : iPhone Case (4/4S) Purple ปกติ 1,150.00 บ.
Jung Yonghwa : iPhone Case (4/4S) White ปกติ 1,150.00 บ.
Jung Yonghwa Mini Album Mobile Phone Strap ปกติ 699.00 บ.
Jung Yonghwa Photo Note ปกติ 775.00 บ.
Jung Yonghwa Photo Note ปกติ 615.00 บ.
Jung Yonghwa Post-it Index ปกติ 550.00 บ.
Jung Yonghwa Post-it Standing Type ปกติ 599.00 บ.
Kim Hyunjoong Mini Album Mobile Phone Strap ปกติ 715.00 บ. Mouse Pad ปกติ 695.00 บ. Mouse Pad ปกติ 615.00 บ.
Mun Geunyoung Mini Album Mobile Phone Strap ปกติ 715.00 บ.
Mun Geunyoung Photo Note ปกติ 775.00 บ. Park Shinhye : iPhone Case (4/4S) Illustrated ปกติ 1,150.00 บ. Park Shinhye : iPhone Case (4/4S) Sky ปกติ 1,150.00 บ. Park Shinhye Photo Note ปกติ 615.00 บ. Park Shinhye Post-it Index ปกติ 550.00 บ. Park Shinhye Post-it Standing Type ปกติ 599.00 บ. Photo Sticker of Jang Geunsuk ปกติ 600.00 บ.
Polaris Key Holder ปกติ 699.00 บ.
Polaroid DECO Postcard : MuGyul Mary 10 sheets ปกติ 625.00 บ.
Post-it (Hardcover) ปกติ 695.00 บ.
Post-it (Standing Type) Couple ปกติ 599.00 บ.
Post-it (Standing Type) Mary ปกติ 599.00 บ.
Post-it Index (Mary) ปกติ 550.00 บ.
Post-it Index (Mugyul) ปกติ 550.00 บ.
Pot-it (Standing Type) Mugyul ปกติ 599.00 บ.
Snowman Mobile Phone Strap ปกติ 699.00 บ. Easy Korean Grammar for Foreigners ปกติ 715.00 บ.
Korean Grammar for International Learners ปกติ 1,035.00 บ.
Korean Grammar for International Learners Workbook ปกติ 995.00 บ.
Korean Grammar in Use - Advanced ปกติ 1,185.00 บ.
Korean Grammar in Use - Beginning ปกติ 1,085.00 บ.
Korean Grammar in Use - Intermediate ปกติ 1,085.00 บ.
Korean Grammar Practice for Foreigners : Advanced Level ปกติ 1,125.00 บ.
Korean Grammar Practice for Foreigners : Beginning Level ปกติ 1,235.00 บ.
Korean Grammar Practice for Foreigners : Intermediate Level ปกติ 1,235.00 บ.
Korean Verbs Adjectives for Beginners ปกติ 1,045.00 บ. Business Korean ปกติ 1,075.00 บ. Essential Korean for Business Use ปกติ 875.00 บ.
Korean Language for a Good Job 1 ปกติ 875.00 บ.
Korean Language for a Good Job 2 ปกติ 875.00 บ.
Korean Language for Academics in Business Administration ปกติ 925.00 บ. สนทนาภาษาเกาหลีสำหรับคนทำงาน 1 ปกติ 875.00 บ. Story Time (R-1) : The Three Little Pigs ปกติ 440.00 บ. Story Time (R-2) : The Bremen Town Musicians ปกติ 440.00 บ. Story Time (R-3) : Jack and the Beanstalk ปกติ 440.00 บ. Story Time (R-4) : Scary Lessons ปกติ 440.00 บ. Story Time (R-5) : Ali Baba and the Forty Thieves ปกติ 440.00 บ. Story Time (R-6) : The Birds, the Beasts and the Bat ปกติ 440.00 บ. Story Time (Y-1) : Puss in Boots ปกติ 440.00 บ. Story Time (Y-2) : The Emperor's New Clothes ปกติ 440.00 บ. Story Time (Y-3) : The Mouse Girl ปกติ 440.00 บ. Story Time (Y-4) : Cinderella ปกติ 440.00 บ. Story Time (Y-5) : The Pied Piper from Hamelin ปกติ 440.00 บ. Story Time (Y-6) : Aladdin and the Magic Lamp ปกติ 440.00 บ. Journey into Grammar 1 ปกติ 440.00 บ. Journey into Grammar 10 ปกติ 440.00 บ. Journey into Grammar 2 ปกติ 440.00 บ. Journey into Grammar 3 ปกติ 440.00 บ. Journey into Grammar 4 ปกติ 440.00 บ. Journey into Grammar 5 ปกติ 440.00 บ. Journey into Grammar 6 ปกติ 440.00 บ. Journey into Grammar 7 ปกติ 440.00 บ. Journey into Grammar 8 ปกติ 440.00 บ. Journey into Grammar 9 ปกติ 440.00 บ.
Phonics Champ 1 (Student Book) ปกติ 525.00 บ.
Phonics Champ 2 (Student Book) ปกติ 525.00 บ.
Phonics Champ 3 (Student Book) ปกติ 525.00 บ.
Phonics Champ 4 (Student Book) ปกติ 525.00 บ.
Phonics Champ Starter (Student Book) ปกติ 525.00 บ. Active English 1-1 ปกติ 440.00 บ. Active English 1-2 ปกติ 440.00 บ. Active English 1-3 ปกติ 440.00 บ. Active English 2-1 ปกติ 440.00 บ. Active English 2-2 ปกติ 440.00 บ. Active English 2-3 ปกติ 440.00 บ. Active English 3-1 ปกติ 440.00 บ. Active English 3-2 ปกติ 440.00 บ. Active English 3-3 ปกติ 440.00 บ. Active English 4-1 ปกติ 440.00 บ. Active English 4-2 ปกติ 440.00 บ. Active English 4-3 ปกติ 440.00 บ. Base Camp Student Book and Workbook 1 ปกติ 500.00 บ. Base Camp Student Book and Workbook 2 ปกติ 500.00 บ. Base Camp Student Book and Workbook 3 ปกติ 500.00 บ. Base Camp Student Book and Workbook 4 ปกติ 500.00 บ. Base Camp Student Book and Workbook 5 ปกติ 500.00 บ. Base Camp Student Book and Workbook 6 ปกติ 500.00 บ. Challenge Student Book and Workbook 6 ปกติ 525.00 บ. Challenge Student Book and Workbook 1 ปกติ 525.00 บ. Challenge Student Book and Workbook 2 ปกติ 525.00 บ. Challenge Student Book and Workbook 3 ปกติ 525.00 บ. Challenge Student Book and Workbook 4 ปกติ 525.00 บ. Challenge Student Book and Workbook 5 ปกติ 525.00 บ. Jump Up Student Book and Workbook 1 ปกติ 525.00 บ. Jump Up Student Book and Workbook 2 ปกติ 525.00 บ. Jump Up Student Book and Workbook 3 ปกติ 525.00 บ. Jump Up Student Book and Workbook 4 ปกติ 525.00 บ. Jump Up Student Book and Workbook 5 ปกติ 525.00 บ. Jump Up Student Book and Workbook 6 ปกติ 525.00 บ. Premier English 1 ปกติ 400.00 บ. Premier English 2 ปกติ 400.00 บ. Premier English 3 ปกติ 400.00 บ. Premier English 4 ปกติ 400.00 บ. Premier English 5 ปกติ 400.00 บ. Premier English 6 ปกติ 400.00 บ. Premier English 7 ปกติ 400.00 บ. Premier English 8 ปกติ 400.00 บ. Summit Student Book and Workbook 1 ปกติ 525.00 บ. Summit Student Book and Workbook 2 ปกติ 525.00 บ. Summit Student Book and Workbook 3 ปกติ 525.00 บ. Summit Student Book and Workbook 4 ปกติ 525.00 บ. Summit Student Book and Workbook 5 ปกติ 525.00 บ. Summit Student Book and Workbook 6 ปกติ 525.00 บ. Turning Point Student Book and Workbook 6 ปกติ 525.00 บ. Turning Point Student Book and Workbook 1 ปกติ 525.00 บ. Turning Point Student Book and Workbook 2 ปกติ 525.00 บ. Turning Point Student Book and Workbook 3 ปกติ 525.00 บ. Turning Point Student Book and Workbook 4 ปกติ 525.00 บ. Turning Point Student Book and Workbook 5 ปกติ 525.00 บ. Active Korean 1-4 (Seoul National University) ปกติ 3,280.00 บ. Easy Korean for Foreigners 1-4 Workbook 1-4 ปกติ 7,120.00 บ.
Ewha Korean 1-1~6 ปกติ 9,015.00 บ.
Ewha Korean 1-1~6 Ewha Korean Workbook 1-1~6 ปกติ 24,825.00 บ.
Korean 1-4 and Practice Book 1-4 with CD (Seoul National University) ปกติ 11,750.00 บ.
Korean 1-4 with CD (Seoul National University) ปกติ 5,780.00 บ.
Korean 1-6 in 100 Hours ปกติ 6,510.00 บ.
Korean Grammar and Vocabulary Practice for Foreigners : Beginning-Advanced Level ปกติ 7,300.00 บ.
Korean Grammar Practice for Foreigners : Beginning - Advanced Level ปกติ 3,595.00 บ.
Korean Vocabulary Practice for Foreigners : Beginning - Advanced Level ปกติ 3,705.00 บ.
Seoul University Korean 1AB and 2AB (Student's Book and Workbook) ปกติ 10,920.00 บ.
Yonsei Korean 1-1-6 ปกติ 9,995.00 บ.
Yonsei Korean 1-1-6 and Yonsei Korean Workbook 1-1-6 ปกติ 13,320.00 บ.
Yonsei Korean Reading 1-6 ปกติ 5,700.00 บ. พจนานุกรมเกาหลี-ไทย และ ไทย-เกาหลี ปกติ 4,300.00 บ. แบบเรียนการฟัง พูด อ่าน เขียนภาษาเกาหลีเบื้องต้น ปกติ 4,140.00 บ.
Ewha Korean 3-1 Ewha Korean Workbook 3-1 Ewha Korean Study Guide 3-1 English Version ปกติ 2,565.00 บ.
Ewha Korean 3-2 Ewha Korean Workbook 3-2 Ewha Korean Study Guide 3-2 English Version ปกติ 2,565.00 บ.
Ewha Korean 4 Ewha Korean Workbook 4 Ewha Korean Study Guide 4 English Version ปกติ 2,929.00 บ.
Ewha Korean 5 Ewha Korean Workbook 5 Ewha Korean Study Guide 5 English Version ปกติ 2,929.00 บ.
Ewha Korean 6 Ewha Korean Workbook 6 Ewha Korean Study Guide 6 English Version ปกติ 2,929.00 บ.
Ewha Korean English Version 1-1 Ewha Korean Workbook 1-1 Ewha Korean Study Guide 1-1 English ปกติ 2,565.00 บ.
Ewha Korean English Version 1-1 and Ewha Korean Workbook 1-1 ปกติ 1,670.00 บ.
Ewha Korean English Version 1-2 and Ewha Korean Workbook 1-2 ปกติ 1,670.00 บ.
Ewha Korean English Version 1-2 Ewha Korean Workbook 1-2 Ewha Korean Study Guide 1-2 English ปกติ 2,565.00 บ.
Ewha Korean English Version 2-1 and Ewha Korean Workbook 2-1 ปกติ 1,670.00 บ.
Ewha Korean English Version 2-1 Ewha Korean Workbook 2-1 Ewha Korean Study Guide 2-1 English ปกติ 2,565.00 บ.
Ewha Korean English Version 2-2 and Ewha Korean Workbook 2-2 ปกติ 1,670.00 บ.
Ewha Korean English Version 2-2 Ewha Korean Workbook 2-2 Ewha Korean Study Guide 2-2 English ปกติ 2,565.00 บ.
Ewha Korean English Version 3-1 and Ewha Korean Workbook 3-1 ปกติ 1,670.00 บ.
Ewha Korean English Version 3-2 and Ewha Korean Workbook 3-2 ปกติ 1,670.00 บ.
Ewha Korean English Version 4 and Ewha Korean Workbook 4 ปกติ 1,930.00 บ.
Ewha Korean English Version 5 and Ewha Korean Workbook 5 ปกติ 1,930.00 บ.
Ewha Korean English Version 6 and Ewha Korean Workbook 6 ปกติ 1,930.00 บ.
Korean Grammar and Vocabulary Practice for Foreigners : Advanced Level ปกติ 2,360.00 บ.
Korean Grammar and Vocabulary Practice for Foreigners : Beginning Level ปกติ 2,470.00 บ.
Korean Grammar and Vocabulary Practice for Foreigners : Intermediate Level ปกติ 2,470.00 บ.
Korean Grammar for International Learners : Student Book and Workbook ปกติ 1,900.00 บ.
Seoul University Korean 1A (Student's Book and Workbook) ปกติ 2,120.00 บ.
Seoul University Korean 1A and 1B (Student's Book and Workbook) ปกติ 5,460.00 บ.
Seoul University Korean 1B (Student's Book and Workbook) ปกติ 2,120.00 บ.
Seoul University Korean 2A (Student's Book and Workbook) ปกติ 2,120.00 บ.
Seoul University Korean 2A and 2B (Student's Book and Workbook) ปกติ 5,460.00 บ.
Seoul University Korean 2B (Student's Book and Workbook) ปกติ 2,120.00 บ.
Seoul University Korean 3A and 3B (Student's Book and Workbook) ปกติ 5,460.00 บ.
Seoul University Korean 4A and 4B (Student's Book and Workbook) ปกติ 5,460.00 บ.
Seoul University Korean 5A and 5B (Student's Book and Workbook) ปกติ 5,460.00 บ.
Seoul University Korean 6A and 6B (Student's Book and Workbook) ปกติ 5,460.00 บ. Standard Test of Proficiency in Korean : Advanced and Complete Guide to the TOPIK : Advanced ปกติ 1,555.00 บ. Standard Test of Proficiency in Korean : Beginning and Complete Guide to the TOPIK : Basic ปกติ 1,555.00 บ. Standard Test of Proficiency in Korean : Intermediate and Complete Guide to the TOPIK : Intermediate ปกติ 1,555.00 บ. Test Guide to the NEW TOPIK : TOPIK I and II ปกติ 1,740.00 บ.
Yonsei Korean 1-1, 1-2 English Version and Yonsei Korean Workbook 1 ปกติ 3,995.00 บ.
Yonsei Korean 2-1, 2-2 English Version and Yonsei Korean Workbook 2 ปกติ 3,995.00 บ.
Yonsei Korean 3 English Version and Yonsei Korean Workbook 3 ปกติ 2,220.00 บ.
Yonsei Korean 4 and Yonsei Korean Workbook 4 ปกติ 2,220.00 บ.
Yonsei Korean 5 and Yonsei Korean Workbook 5 ปกติ 2,220.00 บ.
Yonsei Korean 6 and Yonsei Korean Workbook 6 ปกติ 2,220.00 บ.
Korean Classroom Peek - Activity for Beginning Intermediate Learners ปกติ 995.00 บ.
Korean Classroom Peek - Teacher's Guide (Beginning) ปกติ 1,375.00 บ.
Korean Classroom Peek - Teacher's Guide (Intermediate) ปกติ 1,375.00 บ. Open Korean - Advanced 1 ปกติ 1,299.00 บ. Open Korean - Advanced 2 ปกติ 1,299.00 บ. Open Korean - Beginner 1 ปกติ 1,299.00 บ. Open Korean - Beginner 2 ปกติ 1,299.00 บ. Open Korean - Beginner 3 ปกติ 1,299.00 บ. Open Korean - Beginner's Book ปกติ 1,095.00 บ. Open Korean - Intermediate 1 ปกติ 1,299.00 บ. Open Korean - Intermediate 2 ปกติ 1,299.00 บ. Open Korean - Intermediate 3 ปกติ 1,299.00 บ. Standard Korean Study Materials for High School Students 1 ปกติ 995.00 บ. Standard Korean Study Materials for High School Students 2 ปกติ 995.00 บ. Standard Korean Study Materials for Middle School Students 1 ปกติ 995.00 บ. Standard Korean Study Materials for Middle School Students 2 ปกติ 995.00 บ. Teaching Guide of Standard Korean Study for High School Students 1 ปกติ 1,275.00 บ. Teaching Guide of Standard Korean Study for High School Students 2 ปกติ 1,275.00 บ. Teaching Guide of Standard Korean Study for Middle School Students 1 ปกติ 1,195.00 บ. Teaching Guide of Standard Korean Study for Middle School Students 2 ปกติ 1,195.00 บ. Complete Guide to the TOPIK : Advanced ปกติ 765.00 บ. Complete Guide to the TOPIK : Basic ปกติ 765.00 บ. Complete Guide to the TOPIK : Intermediate ปกติ 765.00 บ. Standard Test of Proficiency in Korean (STOPIK) : Advanced ปกติ 790.00 บ. Standard Test of Proficiency in Korean (STOPIK) : Beginning ปกติ 790.00 บ. Standard Test of Proficiency in Korean (STOPIK) : Intermediate ปกติ 790.00 บ.
TOPIK MASTER Final_ADVANCED ปกติ 1,175.00 บ.
TOPIK MASTER Final_BASIC ปกติ 1,175.00 บ.
TOPIK MASTER Final_INTERMEDIATE ปกติ 1,175.00 บ.